Make things sweet and simple with this Refreshing Mango Pie. Follow this easy recipe to learn how to prepare this seriously citrusy dessert! Mix graham crumbs, butter and sugar; press onto bottom and up side of 9-inch pie plate. Bake 8 to 10 min. or until lightly browned. Cool completely. Meanwhile, peel and pit 1 mango; place in blender. Add cream cheese; blend until smooth. Transfer to medium bowl. Whisk in COOL WHIP. Add boiling water to gelatin mix in large bowl; stir 2 min. until completely dissolved. Add enough ice to cold water to make 1/2 cup. Add to gelatin; stir until slightly thickened. Remove and discard any unmelted ice. Add mango mixture; whisk until blended. Refrigerate 15 to 20 min. or until mixture is thick enough to mound. Spoon gelatin mixture into crust. Refrigerate 3 hours or until firm. Peel and slice remaining mango just before serving pie; arrange over pie. Short on time? Prepare recipe as directed except do not bake the crust. If fresh mangos are unavailable, use 2 cups cut-up jarred or thawed frozen mangos instead. Blend 1 cup mangos for filling and use remaining for garnish. Place measured amount of cream cheese in microwaveable bowl. Microwave on HIGH 10 to 15 sec. or just until softened. 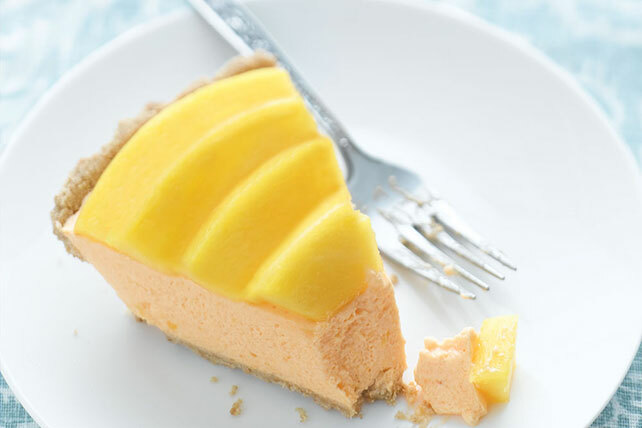 This refreshing pie can be refrigerated up to 24 hours before topping with remaining mango and serving as directed.